This is a sale for a pair of brand new genuine Honda Acura Civic CRX Del Sol Integra B16A B16B B18C Countershaft 1st Gear Needle Bearing 37x42x25 from Honda Motors, Japan. It will fit the aforementioned applications from 92-01 B-series DOHC VTEC manual hydraulic transmissions except JDM Integra Type R 98+ S80 4.785 Final Drive Ratio Transmission. 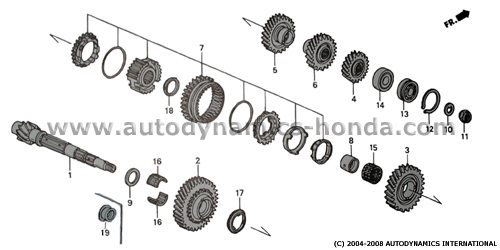 These countershaft needle bearings (No.16 in the B-series DOHC VTEC hydraulic transmission countershaft components diagram below) are located at the countershaft 1st gear.